Simple on the one hand, and quite elegant on the other, this dessert always gets a five-star rating around our table. 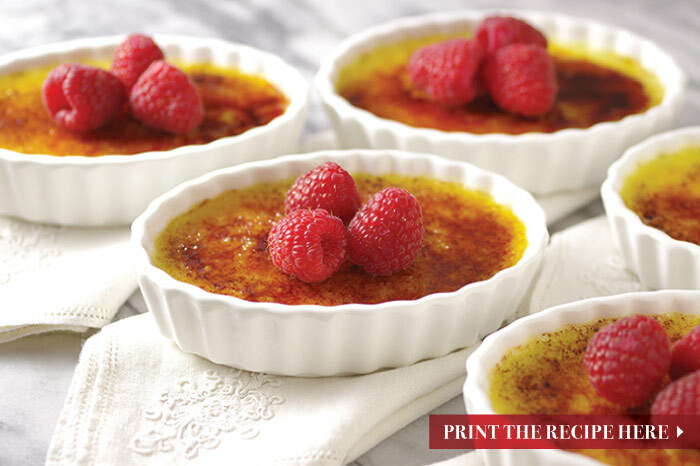 Directly translated, the French term, crème brûlée means “burnt cream.” The dessert consists of vanilla-rich custard topped with a layer of caramelized sugar. The sugar transforms to a thin, hard crust with a subtle burnt flavor that perfectly complements the sweet custard. 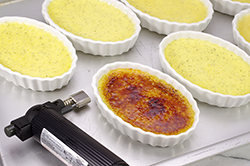 With just five ingredients, the making of crème brûlée is all technique. Once mastered – and it’s easy to do so -- this dessert will become a signature dish in your repertoire. 1. Preheat oven to 325°F. 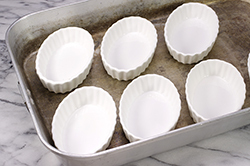 Place individual ramekins in a larger rimmed baking pan. 2. Heat the cream, and add half the sugar. Split a fresh vanilla bean lengthwise and scrape the tiny seeds and pulp away with the edge of a knife. Add the seeds, pulp, and the entire bean to the cream mixture. Bring to a simmer – just short of a boil. 3. 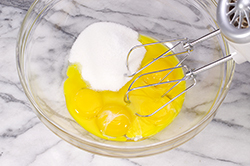 Meanwhile, in a medium mixing bowl with a hand mixer, beat together the egg yolks, the other half of the sugar, and salt until well combined and slightly lightened in color. 4. 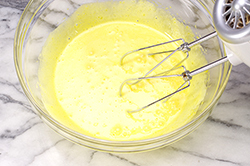 Temper the egg yolk mixture by drizzling in a half a cup of the warm cream while continuously whisking. Repeat the addition of warmed cream in increments until all is added. 5. 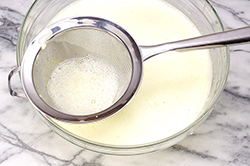 Pour the mixture through a fine sieve to remove any curdled egg and large vanilla bean pieces. 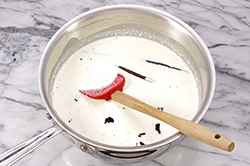 Skim off any foam that forms on the top of the mixture. 6. Pour the strained mixture into individual ramekins filling them nearly to top. Place the baking pan of ramekins in the oven. Carefully add water to the pan to surround the ramekins to a height halfway up the sides of the ramekins. 7. 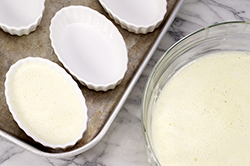 Bake at this low oven temperature until the custard is set – that is, when the edges are set, and the center is thickened yet still has a llittle jiggle. 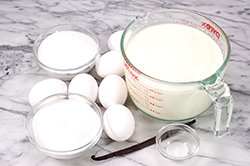 Baking times will vary based on the type and size of ramekin used. For the ramekins we used (1/2-inch custard depth), we baked them for 35 minutes; bake deeper ramekins for a longer period of time – as much as 60 minutes. 8. Carefully remove the ramekins from the water and cool on a rack. 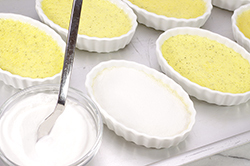 Cover each ramekin with plastic wrap and chill thoroughly for 4 hours or up to 3 days. 10. Serve immediately for maximum crackle in the crust (vs. a softened crust which can happen over time). We like to serve our crème brûlée with demitasse spoons to savor each small bite.